Exploring Rio with locals is a terrific way to get a true flavour of the city! Locals playing football on Ipanema beach at sunset. 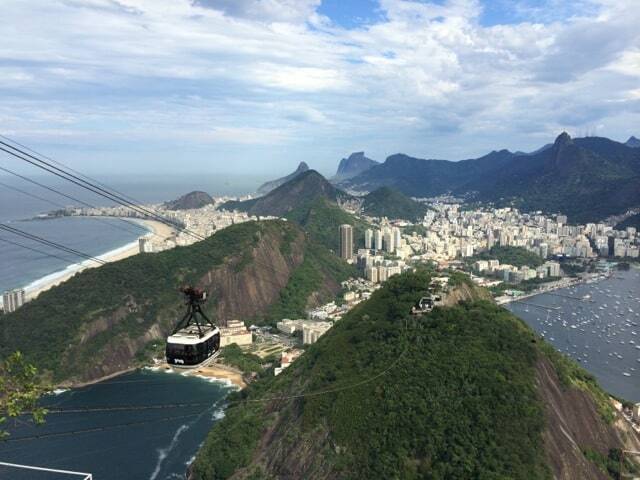 Rio de Janeiro is one of my favourite cities to visit and I’ll jump on any opportunity to go there. I’ll never tire of its spectacular natural setting, the beaches, the architecture and street art, and its unique vibe. When I received an invitation to speak at a conference in Belo Horizonte (read about my trip to Belo Horizonte and my road trip along the Estrada Real), I made sure I got to spend a few days in Rio on my way back home. This time, I was joined by my blogger friends, Claudia (who blogs at Aprendiz de Viajante) and Mauricio (Trilhas e Aventuras), two Cariocas, who promised to show me around. I was excited about the prospect of exploring Rio with locals! It was my fifth time in Rio de Janeiro so I’d already seen the major sights like the Sugarloaf Mountain, the Sambadrome and the Christ Statue. I’d also explored the various districts such as Santa Teresa (my favourite), Lapa, Ipanema, Leblon and of course Copacabana. Claudia and Mauricio said they would show me something new this time. I was fine with that – I was already excited just being back in this vibrant city! An iconic view of Rio from the Christ Statue on Corcovado mountain. I stayed at Hotel Vilamar Copacabana, a high-rise hotel located just two blocks from the world-famous Copacabana Beach. My room was spacious, with an equally large bathroom. The furnishings were quite simple but most importantly, the bed was very comfortable! When I checked in, the receptionist mentioned that there was a rooftop pool so I decided to check it out first. It turned out to be more of a plunge pool – perfect to cool-off in the hot summer months – while the terrace offered views of the office and apartment blocks in Copacabana. My room at Hotel Vilamar Copacabana. Claudia met me at the hotel lobby and we walked to the Cantagalo metro station (a short walk from the hotel) where we hopped on a metro that took us to the city centre. Claudia told me that parts of the downtown area had been regenerated in the run-up to the Rio Olympics. We exited the metro at the Carioca station and soon found ourselves amidst the hustle and bustle of the downtown area. I quickly noticed the new pavements and there was even a new, rather futuristic-looking tram line, that connects the downtown area with the Olympic Boulevard at the site of the old port. We strolled around the busy downtown area and slowly made our way to Rio’s newest attractions: the Museu do Amanhã (Museum of Tomorrow) and the Olympic Boulevard. As we approached the waterfront, I was amazed by how different it looked. In the past, an ugly elevated highway literally cut the downtown area off from the docks, but that has now made way for large squares with beautiful artworks and views of Guanabara Bay. Our first stop was the Museum of Tomorrow, a lightning rod-like structure that juts into the bay. Designed by the famous Spanish architect, Santiago Calatrava (who also designed the spectacular City of Arts and Sciences in Valencia and the new Oculus station in New York), the Museum of Tomorrow cleverly mixes art and science to build a case for sustainability. Me and Claudia posing for a selfie at the Museum of Tomorrow. From here, we made our way to the Olympic Boulevard in the old docklands area. The first thing that grabbed my attention was the amazing mural that seemed to go on forever – in fact, its 190 meters long! 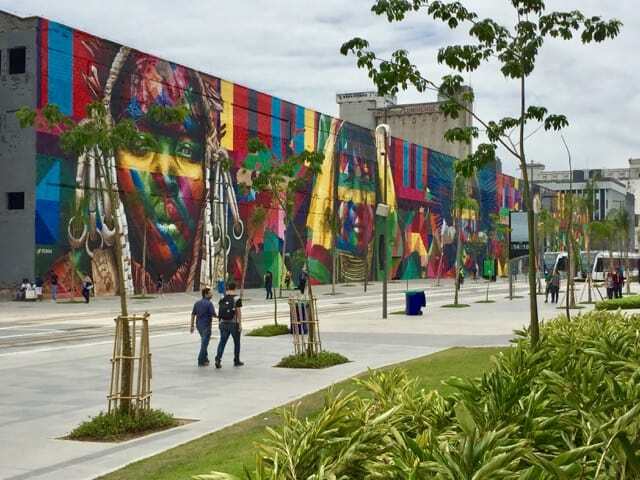 Created by the Brazilian street artist, Eduardo Kobra, this mural depicts five faces of indigenous people from five continents and is on record as the largest mural ever created by a single artist. Gorgeous art at the Olympic Boulevard. 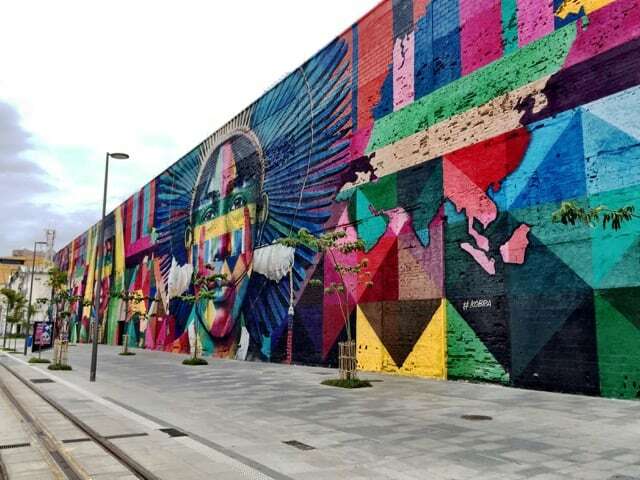 The stunning mural by Eduardo Kobra. It’s amazing to think that a single artist created this! One of the five faces on the Olympic Boulevard mural. There wasn’t much else to see or do along the Olympic Boulevard aside from checking out the food trucks. The old warehouses that line the boulevard were practically empty – I hope the city will use this space to create something cool like a market, pop-up stalls, art exhibitions or a cultural centre. Our final stop as we made our way back to Copacabana was the Botafogo Praia shopping mall in the Botafogo district. Claudia smiled as I asked her what we were doing there. She led me to the top floor and I spotted it almost instantly: the gorgeous view of Botafogo Bay and the Sugarloaf Mountain! We sat at the café and enjoyed the view of this iconic mountain and the many teenage love-birds who flock to the terrace for a kiss and a cuddle, and to get the #BestSelfieRio! That evening, I walked around Copacabana to experience the buzz in the streets. In the same street as the hotel were lots of restaurants and bars, and patrons spilled out onto the streets, sipping their drinks and chatting excitedly (as Brazilians do). I made my way to Copacabana Beach and sat on the soft sand. Around me, I saw families playing football, joggers and couples huddled together at the water’s edge. The entire beach is flood-lit at night so it’s quite safe for an evening stroll. I looked at the beach, which seemed to stretch into the distant horizon, and listened to the sound of the waves. This city never fails to amaze me. Locals playing football on Copacabana Beach at night. The following day, I met up with Mauricio, who had promised to take me to some secluded beaches west of the city. We drove past the expansive suburb of Barra da Tijuca, where many Olympic events were held. With its glorious sun-drenched beaches, vast shopping malls, glassy office towers and condominium blocks, Barra is often called Rio’s ‘Miami’. We passed Barra and kept heading west along the Av. Lucio Costa, which runs parallel to the beach. The views of the shimmering white sand and the Atlantic Ocean were simply gorgeous. A gentleman enjoying the view of the wild coast. At the very end of the avenue, we turned off onto the Av. Estado da Guanabara and entered an area of stunning natural beauty: the natural reserves of Pedra Branca and Grumari. This area is characterised by low forest-clad hills which end abruptly in the ocean. The ocean was visibly rougher here but as we continued, I noticed several small coves and some larger ones lined by beaches. “These are the Wild Beaches of Rio!”, Mauricio announced. We made several stops along the way to admire the view of the rocky coast and the ocean. At our first stop, we spotted several sea turtles popping their heads above the waves. At our second stop at a cliff edge, we looked down and saw a school of manta rays gracefully swimming past the shore. I was awestruck! All this in a little over an hour outside Rio de Janeiro! Waves crashing into a little cove along the wild coast. We spotted several sea turtles in the waves below. Little islets off the coast. From this cliff, we spotted a school of manta rays in the ocean below! I never knew about the ‘Wild Beaches of Rio’ until this day! For a minute, I thought I was in the Caribbean! Not hard to imagine considering the stretches of fine, white sand, lapped by crystal-clear turquoise water. Mauricio explained to me that often, strong ocean currents or rough weather wash away the sand very quickly, and then over time, the beaches re-appear again. He took me to his favourite beach, Playa do Abricó (which also has a nudist beach tucked away behind several large boulders), and as we walked over the soft sand, he told me that until a few weeks ago, this beach was nothing but rocks and boulders! I looked at the sand between my toes and the expanse of sand ahead of me and I have to admit, it was hard to imagine! The gorgeous white sands of Abricó beach. We spent the afternoon here, lounging at a beach bar, strolling on the beach and swimming in the crystalline water. Behind the beach, thick forests covered the almost vertical cliffs, and we could hear the sounds of birds and monkeys. What a magical place! The beach bar at Praia do Abricó. Before we left this gorgeous area, Mauricio had one more treat in store for me: a grilled fish meal at the Mirante da Prahina restaurant! This laid-back restaurant sits on a hill-slope and offers beautiful views of Prahina beach and the ocean. After cleaning the plate of grilled fish, I sat back, cold Brahma beer in hand, and took in the view for the last time. Feet in the sand and beautiful ocean views! Loved this laid-back restaurant! Mauricio taking in the view from Mirante da Prahina restaurant. I was sad to leave Rio. This city never ceases to amaze and this trip was no different. A big thank you to Claudia and Mauricio for showing me around! You both rock! 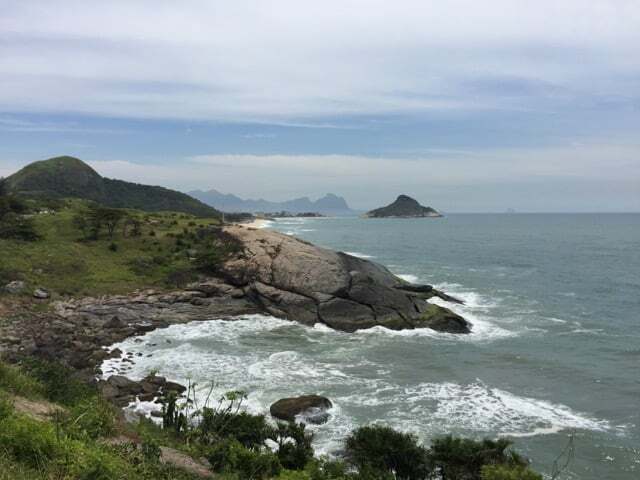 Oh, if you’d like to visit the Wild Beaches of Rio (there’s no public transport to this area), I suggest getting in touch with Mauricio via his blog as he often organises trips to this part of Rio when he’s not travelling. He’s a terrific host and guide! Hi, caution is advised (just basic common sense really; be aware of your surroundings and your belongings wherever you go) but stick to the busy areas (where you’ll see police or security guards on the street), especially at night, and you should be fine. Be sure to ask locals which areas to avoid. Amazing photos of Rio!! 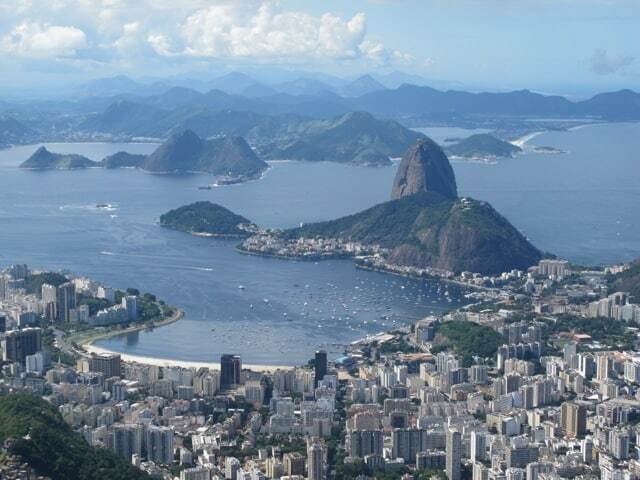 Have always wanted to go there to see the Christ statue, would love to see Sugarloaf Mountain. I’m a little intimidated about Rio, did you feel safe there?